READY NOW! Relax with serene pond views from your 40x8 extended covered lanai. 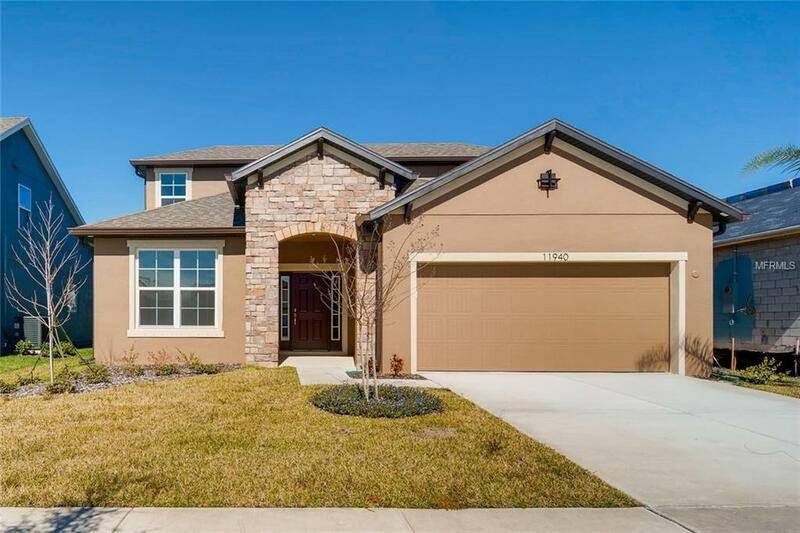 This home is entertaining-friendly with a welcoming stone entry, large foyer, and a kitchen with a large center island open to the great room. The master bedroom offers backyard and pond views as well as a spa-inspired master bath with dual walk-in closets, double vanity and a glass-enclosed walk-in shower. Plus, enjoy a second-floor bonus room, great for guests or a casual family room. Premium features in this home include a gourmet kitchen with double wall oven and glass cook-top, 42" Kinsdale Slate kitchen cabinets, 2x1 gray glass mosaic tiled kitchen backsplash, gray interior paint throughout, and laminate flooring throughout main areas and stairs. Additional steps are taken to make sure this home meets and exceeds the latest ENERGY STAR standards.